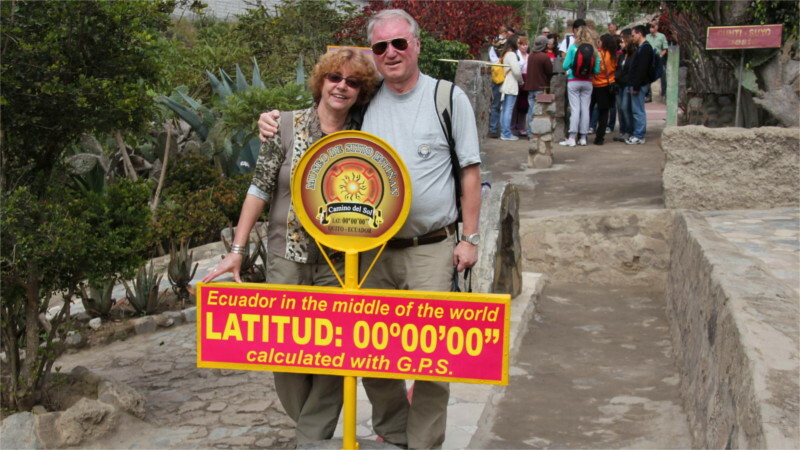 Our Ecuador travel tips prepare you for your tour to Ecuador and the Galapagos. They are in alphabetical order to make it easier to find the information you are looking for. We hope you find answers to any questions you might have. Feel free to contact us if you need more information or have more specific questions. Quito lies at 2850 meters/ 9350 feet. You should take it easy at the beginning, until your body gets used to the altitude. For climbing Ecuador’s mountains you will need some preparation. If you suffer from a light headache, feel tired and breathe heavily after you have arrived in Quito, you are feeling the lack of acclimatization. It is recommended that you drink a lot of water (no alcohol!) and don’t smoke. Coca tea (mate de coca) is also recommended. Stronger symptoms are lack of appetite, nausea, vomiting, dizziness, sleep disorders and swelling of feet, arms and face. If you suffer from very strong headaches you can inhale oxygen. Because of Ecuador’s location on the equator, there are no big seasonal temperature variations throughout the year. The seasons here are the dry and the rainy season. However, there is a big difference in temperature and climate within the country, according to the altitude, and also during one day the temperature can vary a lot. Especially here there is a big variation in temperature during the day. After a sunny morning the temperature rises until midday, before (especially between November and May) there are some heavy rain showers in the afternoon. During the day the temperature can be around 26 °C/ 79 °F, at night it cools down to about 10 °C/ 50 °F. In the jungle it is hot and humid, with some heavy rainfall, usually in the afternoon. The wettest months are usually from May to July, with August and September being the driest months. However, the global climate change can also be noticed in Ecuador, so you cannot rely on this. The South of Ecuador’s Pacific coast is dry and hot, while the hinterland and the North are humid and hot. The coast’s wet season is from December till May and the dry season from June to November. However, the rainy season is the better time for a nice beach vacation, as after the morning’s rain the sun usually comes out, whereas during the dry season the sky is often overcast and the water a bit cooler. The best time for whale watching is between June and September when the humpback whales come north from Antarctica to mate and rear their offspring in the warmer waters. There are two seasons on Galapagos, influenced by two currents. In the first half of the year it is mainly sunny and the water has a temperature of about 23 °C/ 73 °F, but there may be some heavy tropical rain showers. The second half of the year is dry, but, just like on the continental cost, the sky is often overcast and the water is cooler. You are traveling to a country in which you will get to know a culture that is probably very different from your own culture. People, standards of living, modes of interaction and perception of time might take some getting used to at first. But if you approach the foreign culture with an open mind you will be rewarded with an incomparable travel experience. Please note that it is strictly prohibited to export pre-Columbian relicts and souvenirs made from black coral. It is also not allowed to export fruits and vegetables. The Ecuadorian cuisine is varied and tasty. From the most simple almuerzo (cheap set meal for lunch) to the creative gourmet dishes of the modern fusion cuisine. Typical elements are rice, potatoes, plantains, beans, corn, yucca (manioc, a root similar to potato) served with meat or fish. Local specialties sometimes take a bit getting used to – like the cuy (guinea pig) in the Andes or the grilled chontacurros (grubs) in the jungle. The dishes per se are not spicy, that’s what the omnipresent ají is for, a hot chili sauce. A special highlight are the many delicious fruits, some of them can only be found in Ecuador. Most of them are used to prepare fresh juices or milkshakes (batidos). Try for example naranjilla, tree tomato, babaco and many more. Read more about them in our blog post about Ecuadorian fruits. Be careful with food sold by street vendors. Especially at the beginning of your trip it is the best to be careful and eat in restaurants. Also be careful with salads and raw fruits and vegetables that have only been washed with tap water. You should only drink tap water that has been boiled. For brushing your teeth it might be better to use bottled water. Cooked food and fruits which are peeled are in any case preferable. New Year (January 1st), Good Friday, International Workers’ Day (May 1st), Battle of Pichincha (May 24th), First Call for Independence (August 10th), Guayaquil’s Independence (October 9th), All Saints’ Day and Cuenca’s Independence (November 2nd and 3rd), Christmas (December 25th). Sometimes holidays are postponed in order to create a long weekend, and sometimes holidays are added. Ecuador’s official language is Spanish. Kichwa (Quicha), which is spoken by about 2 million indigenous people, is the second official language. There are a total of 23 different languages spoken in Ecuador. In higher class hotels, at the airport and in popular tourism spots you will be able to communicate in English. With some basic Spanish knowledge you will have the possibility to directly communicate with the locals, gaining a direct insight into life in Ecuador. If you want to have your clothes washed, most hotels offer laundry service. In most towns you will also find inexpensive laundries where you can have your clothes washed, dried, and folded. The official currency is the US-Dollar. You can exchange foreign currencies in banks and exchange offices in the big cities. It is usually difficult to pay with bills in large denominations (anything over $20). You can get cash in Ecuador with your credit card from the ATMs which you will find in all the bigger towns (best during the bank’s opening hours). Small towns usually don’t have ATMs, be sure to carry enough cash with you. If you pay using your credit card, you may be charged extra (about 5 %). You can exchange travelers’ checks in some banks, presenting your passport, but this is not very common. In cases of emergency you will find many Western Union offices in Ecuador, which allow you to receive money sent from any country in the world within minutes. In some areas of the jungle there is a very small risk of Malaria. On the coast, there is a small risk of Dengue, Zika and Chikungunya. In general we recommend you use an insect repellent that contains DEET when you are on the coast or in the Amazon. This also helps to keep away the tiny black sandflies, whose bites itch more than the bigger mosquitos’. Our Ecuador travel tips are just recommendations, for specific medical information please consult with a doctor. Most shops open Monday to Friday from 9 am to 6 pm, often closing for lunch break. Malls are open until 8 pm, also on Saturday and Sunday. Banks work from 9 am till 4 pm, branches within malls open on weekends in the morning. On holidays stores and banks stay closed, sometimes also museums and other sights, which might lead to alterations in the program. Ecuador’s international code is +593. Ecuadorian phone numbers include the province’s area code and seven digits. When calling internationally, leave out the first 0. Cell phone numbers start with 09 plus eight digits. In September 2012 the 9 was added. If you find an old nine-digit cell phone number, just add the 9. If you are in Ecuador for a longer period of time you might consider buying an Ecuadorian SIM card. The two big phone companies are Movistar and Claro. The price per minute for a national call is about 20 cents, international calls are about 60 to 80 cents, depending on the country. You will need your passport to buy a SIM card. Leave your passport and credit card in the hotel safe. Take a color copy of your passport with you (also of the page with the immigration stamp or visa). While traveling, carry your passport, credit card and other important documents on your body. We recommend you bring sufficient memory cards with you. In internet cafes you can burn your pictures on CD or save them online, for example on Dropbox (http://www.dropbox.com) . Before taking a person’s picture you should ask them for permission, sometimes they will ask for a small tip. In better restaurants it is customary to give about 5-10 %. Tipping for service providers like guides and drivers is at your discretion. A rough guideline can be $5 per day per person, but it’s up to you. Tipping on Galapagos tours is usually a bit higher. Do you have more Ecuador travel tips for us? Found information that’s no longer up to date? We would really appreciate a short note. Thank you!